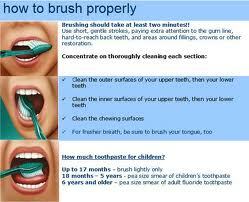 How to BrushWhat Is the Right Way to Brush? Most dental professionals agree that a soft-bristled brush is best for removing plaque and debris from your teeth. Small-headed brushes are also preferable, since they can better reach all areas of the mouth, including hard-to-reach back teeth. For many, a powered toothbrush is a good alternative. It can do a better job of cleaning teeth, particularly for those who have difficulty brushing or who have limited manual dexterity. To find the right Colgate toothbrush for you, . It is important that you use a toothpaste that's right for you. Today there is a wide variety of toothpaste designed for many conditions, including cavities, gingivitis, tartar, stained teeth and sensitivity. Ask your dentist or dental hygienist which toothpaste is right for you. To find the right Colgate toothpaste for you.